Lithium-ion batteries have proven successful for consumer electronics, but electric vehicles, wind turbines or smart grids require batteries with far greater energy capacity. A leading contender is the lithium-metal battery, which differs from lithium ion technology in that it contains lithium metal electrodes. First conceived in 1912, lithium-metal batteries have the potential for huge amounts of energy storage at a low cost, but they suffer from a fatal flaw: dendrites – sharp needles made of clumps of lithium atoms that can cause batteries to heat up and occasionally short-circuit and catch fire. However, the promise of the technology has kept researchers and companies working on ways to overcome this problem. "Lithium-metal batteries are basically the dream batteries since they provide an extremely high energy density," said Reza Shahbazian-Yassar, associate professor of mechanical and industrial engineering at the University of Illinois at Chicago (UIC). "However, we have not been able to build commercially viable lithium-metal batteries with organic liquid electrolytes due to heterogeneous lithium metal plating that leads to dendrites under extended battery cycling." Recently, teams of researchers, including Shahbazian-Yassar at UIC and Perla Balbuena at Texas A&M University, have been inching closer to finding a solution, in part by applying the power of supercomputers to understand the core chemistry and physics at work in dendrite formation and to engineer new materials that can mitigate dendrite growth. Writing in Advanced Functional Materials in February 2018, the researchers presented the results of studies into a new material that may solve the long-standing dendrite problem. 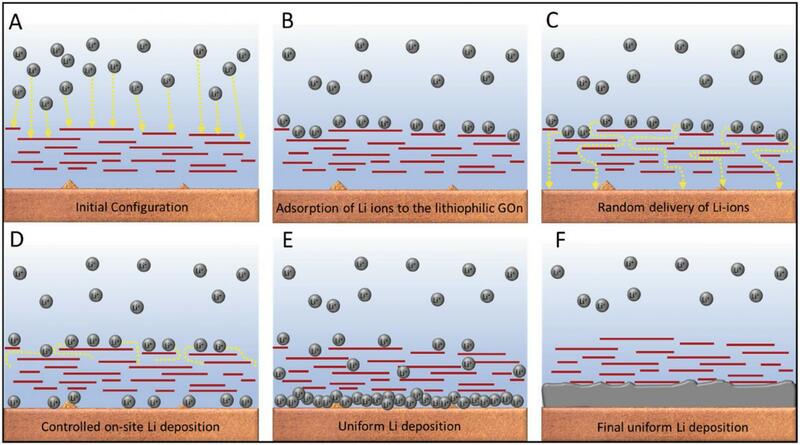 "The idea was to develop a coating material that can protect the lithium metal and make the ion deposition much smoother," said Balbuena, professor of Chemical Engineering at Texas A&M and co-author on the paper. The investigations relied on the Stampede and Lonestar supercomputers at the Texas Advanced Computing Center (TACC) — among the most powerful in the world. In the paper, the researchers described a graphene oxide nanosheet that can be sprayed onto a glass fiber separator which is then inserted into the battery. The material allows lithium ions to pass through it, but slows down and controls how the ions combine with electrons from the surface to become neutral atoms. Instead of forming needles, the deposited atoms form smooth, flat surfaces at the bottom of the sheet. The researchers used computer models and simulations in tandem with physical experiments and microscopic imaging to reveal how and why the material effectively controls lithium deposition. They showed that the lithium ions form a thin film on the surface of the graphene oxide and then diffuse through defect sites — essentially gaps in the layers of the material — before settling below the bottom layer of the graphene oxide. The material acts like the pegs in a pachinko game, slowing and directing the metal balls as they fall. "Our contribution was to conduct molecular dynamics simulations where we follow the trajectory of the electrons and atoms in time and observe what's going on at the atomistic level," Balbuena said. "We were interested in elucidating how the lithium ions were diffusing through the system and becoming atoms when the deposition ends in lithium plating." The graphene-oxide-doped batteries show an enhanced cycle life and exhibit stability up to 160 cycles, whereas an unmodified battery rapidly loses its efficiency after 120 cycles. The oxide can be applied simply and affordably with a spray coating gun. How the spray is layered on the nanosheets was another focus of the research. "When you do the experiment, it's not clear at the microscopic level where the coating will sit," said Balbuena. "It's very thin, so locating these coatings with precision is not trivial." Their computer model explored whether it would be more favorable if the oxide were oriented parallel or perpendicular to the current collector. Both can be effective, they found, but if deposited in parallel, the material requires a certain number of defects so ions can slip through. "The simulations gave our collaborators ideas about the mechanism of ion transfer through the coating," Balbuena said. "It's possible that some of the future directions may involve different thickness or chemical composition based on the phenomenon that we observed." In separate research, published in ChemSusChem in February 2018, Balbuena and graduate student Saul Perez Beltran described a battery design that uses graphene sheets to improve the performance of carbon-sulfur cathodes for lithium-sulfur batteries, another potential high-capacity storage system. Besides sulfur's natural abundance, non-toxicity and low-cost, a sulfur-based cathode is theoretically capable of delivering storage up to 10 times greater than the commonly-used lithium-cobalt oxide cathodes in conventional lithium ion batteries. However, chemical reactions in the battery lead to the formation of lithium polysulfides, chemical compounds containing chains of sulfur atoms. Long-chain polysulfides are soluble in the liquid electrolyte and migrate to the lithium metal anode where they decompose, an unwanted effect. On the other hand, short-chain polysulfides are insoluble and remain at the sulfur-based cathode. The researchers investigated how the cathode microstructure may affect this chemistry. They addressed the problem of uncontrolled polysulfide formation by creating a sulfur/graphene composite material that avoids the formation of the soluble long-chain polysulfides. They found that the graphene sheets bring stability to the cathode and improve its ion trapping capabilities. Balbuena's research is supported by the Department of Energy as part the Battery Materials Research and Battery 500 Seedling programs, both of which are aimed at creating smaller, safer, lighter-weight and less expensive battery packs to make electric vehicles more affordable. Stampede and its follow-on Stampede2 are supported by grants from the National Science Foundation and allow tens of thousands of researchers from across the nation to explore problems that could not otherwise we addressed. "These are very extensive computations, that's why we need high performance computers," Balbuena said. "We are heavy users of TACC resources and we are very thankful to The University of Texas for allowing us to use these facilities." For Balbuena, supercomputer-powered fundamental research into next-generation batteries is a perfect synthesis of her interests. "The research is a combination of chemistry, physics and engineering, all enabled by computing, this theoretical microscope that can visualize things through theory."